Figs are starting to show up at the market. Green Kadota figs that look unripe but whose skin yields when poked. Bright pink insides. These are not the Black Mission (dark purple), Calimyrna (yellowish) or Brown Turkey (brown and pink) varieties that I am accustomed to. (For more info on figs I find this site to be helpful.) But I’m not one to be picky about my figs. I love them all equally. And I can’t begin to say how excited I am that it’s the beginning of fig season, knowing that it will last, at least in Israel, well into October. Kadota figs aren’t as sweet as their cousins, which made me think they would be particularly excellent in a savory preparation. They pair naturally with oozy, buttery brie cheese and I decided to make stuffed, baked chicken breasts. Goat cheese would also be incredible here, and any color figs will work. I love the combination of savory and sweet. These are easy to prepare but look impressive, making them ideal for weeknights or company (or, even better, weeknight company). Preheat the oven to 400F. Season the chicken with salt and pepper. Slice each chicken breast lengthwise in the center to create a pouch, careful not to cut all the way through. Stuff with ¼ of the fig mixture and 1 slice of brie. Secure closed with a toothpick. Bake for 25 minutes and flip. Bake for another 15 minutes, or until cooked through. Flip back over, top each chicken breast with additional slice of brie, and bake for another few minutes to melt. Remove from the oven. If any brie has melted out, spoon it over the chicken. Garnish with additional chopped and/or sliced figs. Remove the toothpick and serve immediately. My goodness! This has got to be good! Green figs more common than the other varieties in Italy… but the ones I am used to are sweeter than the brownish ones… so they are probably still another variety! hehehe I had never thought there were so many different kinds of figs! Anyhow, I love figs and cheese together. Great idea to use them as stuffing for chicken! It must be delicious! So interesting! I would love to taste the Italian green figs! 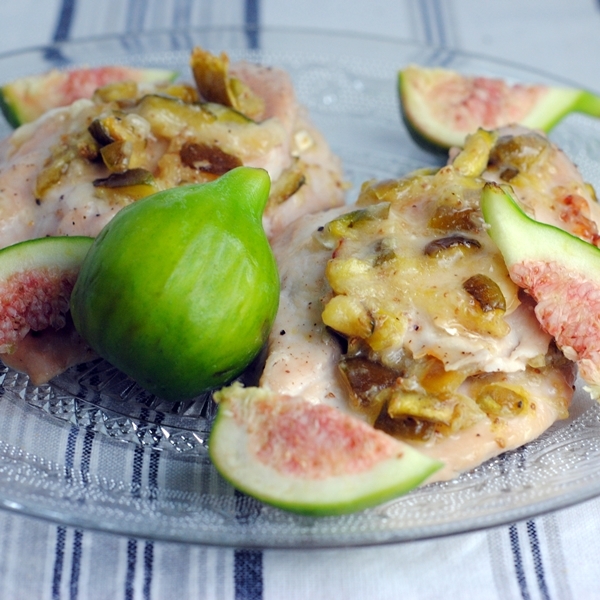 I know fig and brie is a good combination but never thought of adding chicken to it. What a good idea! A special meal like this one will certainly be part of my menu…as soon as fresh figs come my way. Thank you for sharing this very appetizing recipe and also following me on CES. Oh I’m so glad! Yes, I was so excited to see the first figs here! Thanks for stopping by!